Obstetrics For Anaesthetists (Pb): 9780521696708 Paperback - LIMEROCK BOOKS INC.
Anesthetists are a crucial part of the multi-disciplinary team helping mothers have safe, successful pregnancies and deliveries. Obstetrics for Anaesthetists is a practical manual designed to give clinicians a clear knowledge of obstetrics and its implications for their anesthetic practice. Edited by an obstetric anesthetist and an expert obstetrician, this volume provides readers with relevant information on the procedures, terminology, and conditions unique to obstetrics. Algorithms for the management of obstetric emergencies are included, as well as text boxes highlighting the implications of conditions related to pregnancy and co-existing medical diseases. 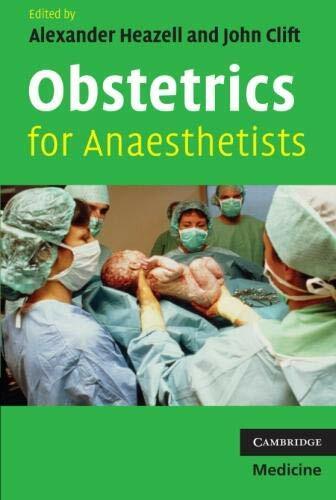 This book is an invaluable practical guide to all aspects of obstetrics relevant to anesthetic practice. This practical guide gives anesthetists key information on obstetric practice to assist in anesthesia during pregnancy and delivery.